Rapamycin is an FDA approved drug that has previously been shown to extend the lives of non-progeria mouse models. 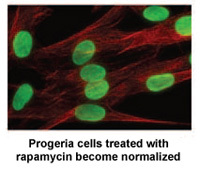 This new study demonstrates that rapamycin decreases the amount of the disease-causing protein progerin by 50%, improves the abnormal nuclear shape, and extends the lifespan of progeria cells. This study provides the first evidence that rapamycin may be able to decrease progerin’s damaging effects in children with progeria. The Progeria Research Foundation was delighted to provide cells for this project from the PRF Cell & Tissue Bank, and help fund the research through our grants program. This exciting new study demonstrates the remarkable pace of progeria research, while providing further insight into the aging process that affects us all.